By now it is common knowledge that history, including the history of art, is constructed from decidedly subjective points of view. Currents of feminist and postcolonial theory attempt to salvage the suppressed narratives of those who have not traditionally been allowed a voice in historical authorship. Multiculturalism attempts to pick out current artists from periphery cultures and insert them into western institutional structures of value. What is evident is that certain histories get buried, and try as we might to unearth them, if we do not use archeological precision, things get reshuffled and looted in the process of rearticulation. What I am suggesting is that if we are not willing to contemplate images from different times and spaces in a way that invokes value systems other than those of the ‘center’ culture, ‘looters’ or exploitative western enterprises, will co-op art for their own ends, and the thick meanings of artwork will not emerge. Further, integrations of modern art labeled as ‘ethnic’ leads to the appropriation of art and the identity of artists by capitalist enterprises and/or institutions that intend to gloss over ethnic difference by choosing representative artists rather than considering groups in a holistic manner. This may seem like an exaggeration, unless we consider the rapid intake of the 20th-21st culture industry. The phenomenon of the ethnic female master in the artworld can act as a vehicle that illustrates the process of the erasure and rearticulation of the suppressed voice in art historical discourse, and the complexities that are involved in this process. Natalia Goncharova and Frida Kahlo experienced similar trauma in their lives and use similar coping mechanisms in their artwork to reconcile their personal pain with their self-identification. They both use a Marxist/Socialist understanding of the local as it connects with the universal. They employ folk motifs in their artwork as a reaction to the trauma caused by violent civil unrest in their native countries and as a cultural construction of the self that would provide a sense of ethnic kinship. However, these motifs are often misread in the current moment: they are invoked as nostalgic reminders of a mythical past and subsumed by popular culture. 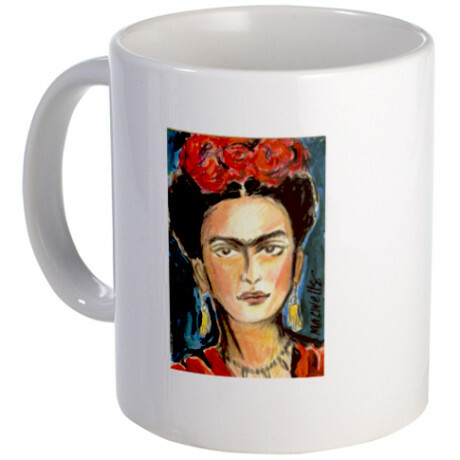 Kahlo’s portraits appear as kitsch, available as T-shirts, coffee mugs, calendars, etc. While Goncharova’s art is the most expensive of any female ever—grossing millions of dollars at auction houses and fielding widespread forgeries of her work. Moreover, the ethnic identity of these female artists has been incorporated into an art historical canon that values artistic personality and surface treatments of meaning over complex inquiries of hybrid expressions of individuality. Essentialization of ethnic and/or female artistic expression happens because it is the path of least resistance, and because it is profitable. It is easy to slip off the path of holistic representation and more difficult to present the complexity that is necessarily integral to readings of art. It is easier to pick out the snatches of imagery that can be assimilated into publicity for the museum and to engineer ethnic female masters for the benefit of established western hierarchies of power. This common practice is an absorption of ethnic talent into a pre-existing framework of western artistic values, rather than a mutual, cross-cultural exchange of ideas. The cult of artistic personality precedes artwork itself in the 21st century artworld. This critical absorption inevitably leads to a commercial one. “It is the structure and social function of the artworld that guarantees the meaninglessness of much of artistic practice today. The artworld is a trap. Promising to protect artists’ work from the commercial instrumentalization of the culture industry, it absorbs the best, the brightest, the most talented practitioners of visual culture and defuses their critical power, rendering them impotent within the larger public sphere.” Absorption into the ‘culture industry’ is difficult to resist. We might ask the question: why is it important for artists to avoid being absorbed by the culture industry and for art historians to avoid perpetrating this absorption? Buck-Morss asserts that a loss of critical power is at stake. 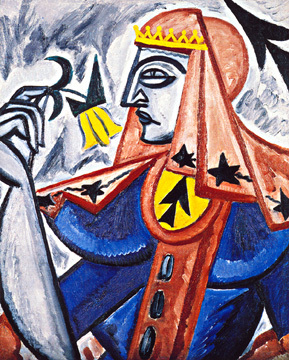 By taking a closer look at the cultural signifiers integrated into the artwork of Goncharova and Kahlo and how these signifiers have been manipulated by the culture industry, we can begin to see how time, space and societal institutions warp artistic intention, symbols and meaning to create a false sense of multiculturalism in the artworld. The female artist finds herself in a precarious place, on the precipice of sincere recognition of artistic skill, ever in danger of falling back into the valley of the female-as-object mode of artistic representation. Male artists do not receive the same focus on personality, because they are not traditionally seen as the object of representation. This allows their artwork to garner inspection independent of and beyond their social lives. Feminism has made these points time and again, and in the process of seeking out female artists to even out the male-dominated canon of western art history, feminism has championed its own canon of female masters. However, an error in translation occurs when an artist acquires a celebrity aura. Feminism has projected all its own hopes and aspirations for a more equal artworld onto the female master. During the journey from a private entity to a public one, things get edited—they are streamlined and essentialized and their complexity melts away. Without admitting to the complexity of an entity, no insightful analysis can be achieved. When an actual person, not their labor, becomes a commodity, their essence is destroyed. This type of commodification of identity has occurred with the artwork of Natalia Goncharova. Goncharova’s work is seen as symptomatic of her female and ethnic Russian identity and valued because of this association. 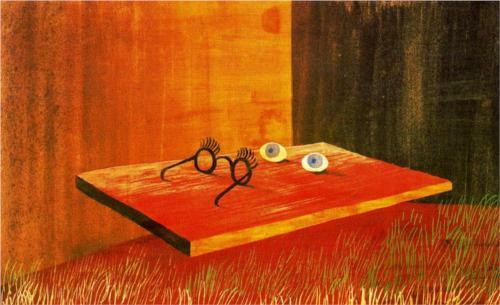 In the current moment her art has been highly associated with Diaghilev and the other artists employed by the Ballets Russes (Picasso, Matisse, De Chirico, Baskt, etc.) In this sense she is fulfilling the need to include a female artist felt by institutional art practitioners when they put on an exhibit of European Avant-Garde artists (V&A, National Gallery). Although many male artists are included in the run-down of Diaghilev’s associates, little mention is made of other female intervention. For instance, Sonia Delaunay is left out, even though her costuming the title character of Cleopatra was wildly popular and innovative in its time. Goncharova’s popularity has skyrocketed in the last 20 years, due to an influx, no doubt, in interest in Avant-Garde artists of the early 20th century; but also because other women who were just as revolutionary have not been given much attention. Because Goncharova is championed by the industry, she is becoming played out. 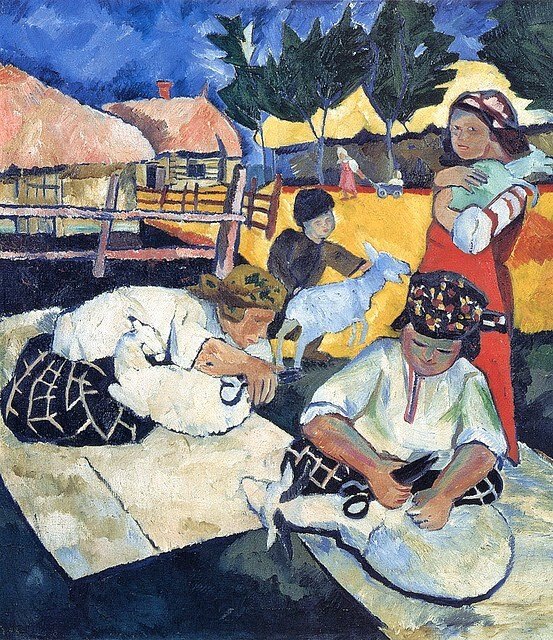 If a more even distribution of institutional attention were given to female Avant-Garde artists working in Russia, Goncharova’s work would not have such a ubiquitous presence and thus would retain more meaning. Analysis of other revolutionary female artists in Russia at the time would include Nina Genke, Kseniya Boguslavskya, Lyubov Popova, Olga Rozanova, or Nadezhda Udaltsova. Multiculturalist forces have also commoditized Frida Kahlo’s artwork. Her work synthesizes ethnic motifs, iconic style and repetition of subject matter to create paintings that are psychologically cathartic for her. In the last fifty years, her work has been appropriated first by streams of feminism and multiculturalism that were seeking to find representatives, and next by all venues of pop culture: T-shirts, calendars, coffee mugs, tattoos, stickers, greeting cards, etc. This repetition has transformed the personality that is Frida Kahlo into a character of legendary status. Along with the transformation of the woman into the icon, all aspects of this iconic persona are absorbed and digested by the public, leaving little room for contemplation of the artwork that is not mediated by the lens of biography. 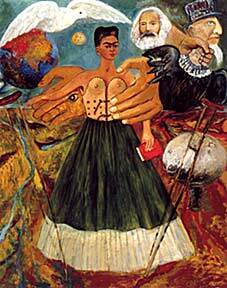 Kahlo’s work is adored primarily because it illustrates her ‘Mexican-ness’ and her female-ness—not because it is good art (although it is). The person of Frida Kahlo has been assimilated into the massive, global culture of the 21st century, which searches out an ‘Other’ to maintain the status quo by making the public feel that ethnicity is being expressed and championed in the artworld, when in fact it is not. The idea of national identity has changed dramatically in the last fifty years. Information sharing, cheaper airfares and the free trade market have allowed for frequent border-crossing, which was simply not possible in the past. For example, one can work in a US firm while living in Denmark, and Iran has more US-educated cabinet members than the US does. The sharing of information includes a sharing of culture. In the current moment, traits like being bi or tri-lingual, knowing courtesies in nations other than one’s own, and having a willingness to travel and re-locate often are all factors that raise one’s value as a worker. Thus, the result of a free trade market is a world monoculture that is mobile and flexible. It is my opinion that this leveling of culture has created a demand for national/ethnic motifs that can be satisfied by art that is ethnically charged—art like that of Kahlo and Goncharova. However, we know that an essentialized vision of culture results when ethnic diversity is employed as merely a tool of multiculturalism. By considering ethnic female artists and ethnic motif in a comprehensive way, we can begin to uncover the meaning that survives in the space between erasure and supersaturation. Rasheed Araeen, “A New Beginning: Beyond Postcolonial Cultural Theory and Identity Politics.” Third Text 14, no. 50 (2000): 3–20. Michael Baxandall, Painting and Experience in Fifteenth-Century Italy: A Primer in the Social History of Pictorial Style. (Oxford University Press, 1988). Michael Baxandall explores the concept of historical contexts in the methodology of art history in detail. Of course it is possible to view any artwork out of context, and to graft one’s own emotional motivations onto it; this approach is not less valid—multiple meanings can strengthen and artwork’s empathetic reach. Susan Buck-Morss, Thinking Past Terror: Islamism and Critical Theory on the Left. (Verso, 2003): 63-73.